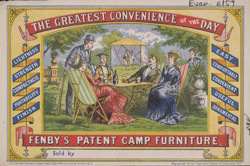 This is an advertisement for Fenby's camp furniture. Picnics were very fashionable outings for wealthy Victorians. Great delight was taken in organising a trip to the coast or to the countryside, the most popular places were the grounds of a ruined castled or building where people could also sketch and explore. These occasions were not simple events, food provision was lavish and included cold joints of beef, lamb, ham and chicken, as well as biscuits, cakes and cheese. Wine and beer were also included and many servants would have been needed to pack and carry all the provisions. Fenby’s furniture would have been very useful for picnicking.